The Minister of Finance and Mass Media Mangala Samaraweera, under the excise Ordinance today issued a special gazette notification which revise the business hours of the liquor licensed establishments in the country. The revised time schedule, which will come into effect from today (Jan. 11), has been listed in the schedule above. Accordingly, the establishments with retail licenses and Beer, Ale, Stout and Wine License for retail sale will be open from 8.00am to 10.00pm. 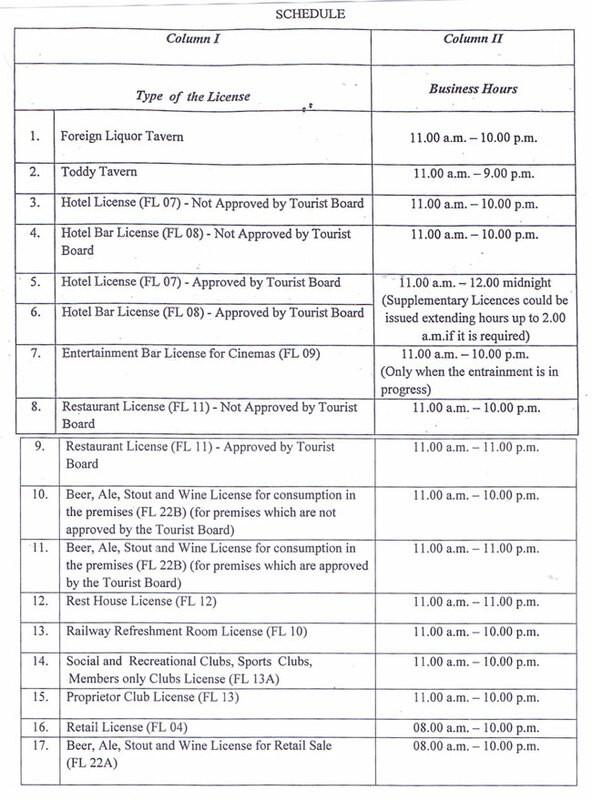 The business hours of Tourist Board- approved premises with Beer, Ale, Stout and Wine License for consumption has been revised as 11am to 11pm while premises without Tourist Board approval will be open from 11am to 10pm.